This pen was ordered from a seller on eBay and arrived in my mailbox 22 days after payment. It was shipped in a zipper bag and a bubble envelope. I paid $5.69 for this pen. 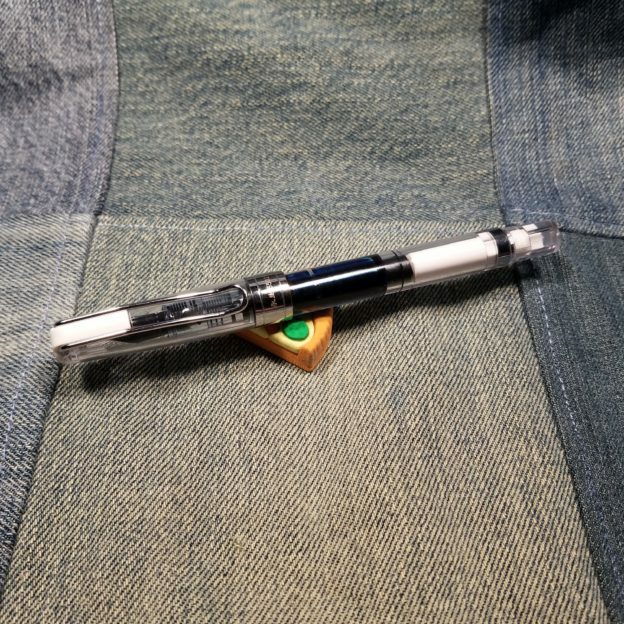 This is another of those pens where it feels like some designers at Wing Sung got really stoned and dumped all the parts of pens into a brown bag, shock it, and drew out parts, and said, “Yeeeeeaaaaaaahhhh, man, that’s rad.” In this case this works. 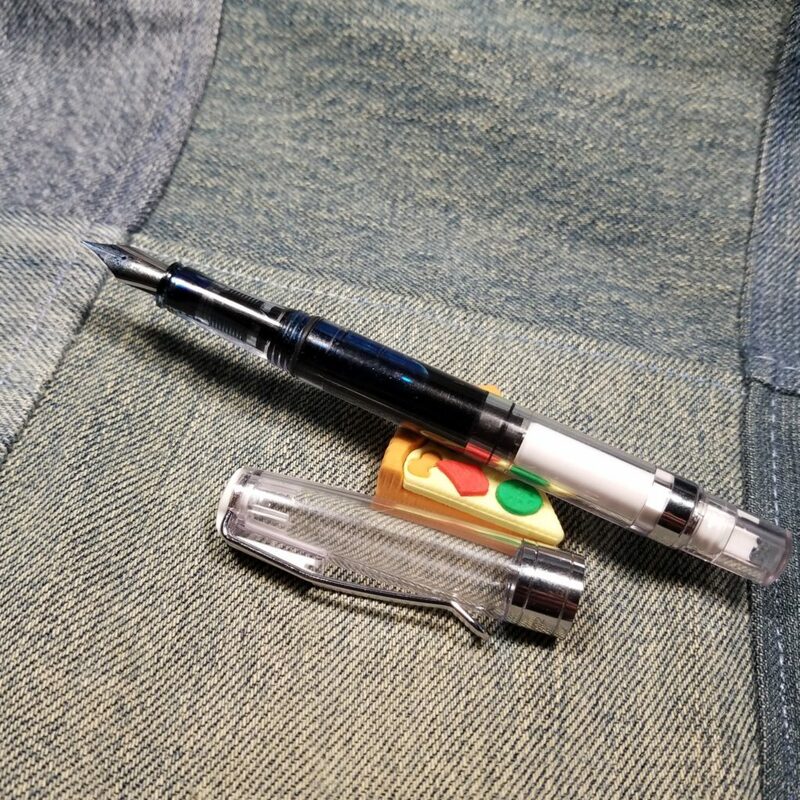 In this case we have a pen that looks inspired by the TWSBI Eco, Lamy Safari, and Pilot Prera. This pen features a locking piston mechanism. To use it you first slide the little end cap away from the pen then twist. When filled align the tabs with the notches and push the cap in to lock it into place. 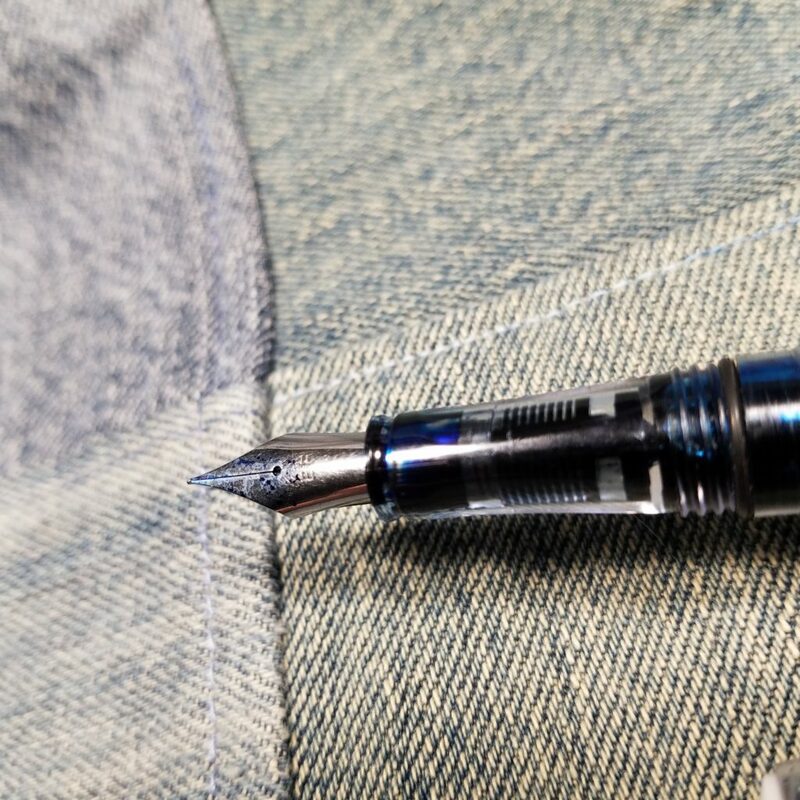 There is a little bit of play in the cap that allows you to lock it into place without losing any ink. Speaking of which, this ink holds roughly 1.8ml of ink. Which is kind of surprising given the size and weight of the pen. This pen feels very light weight but not cheap. 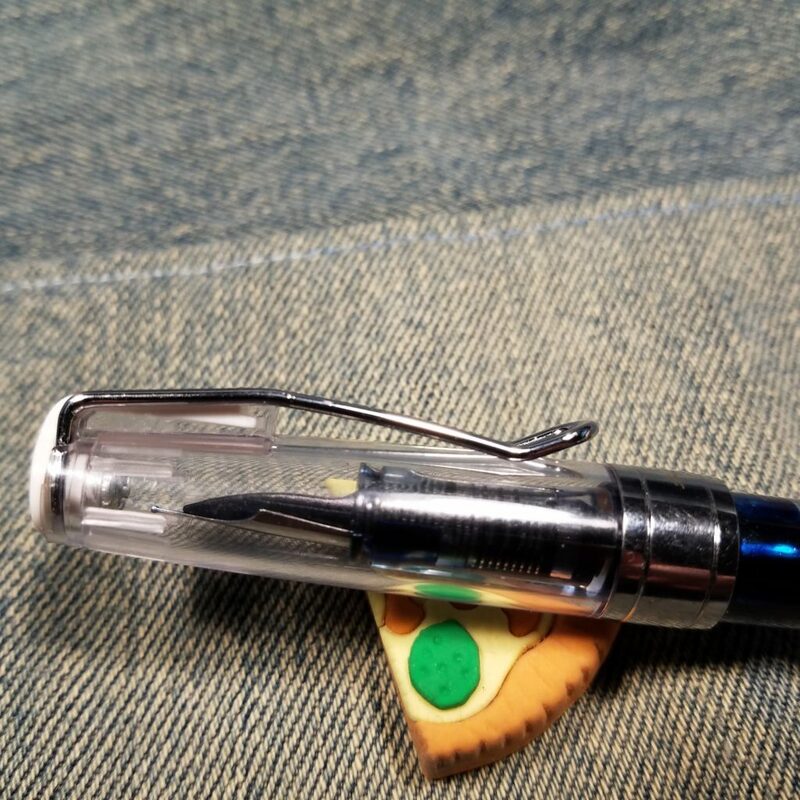 Despite it being a little more slim than other Wing Sung pens it’s very comfortable. 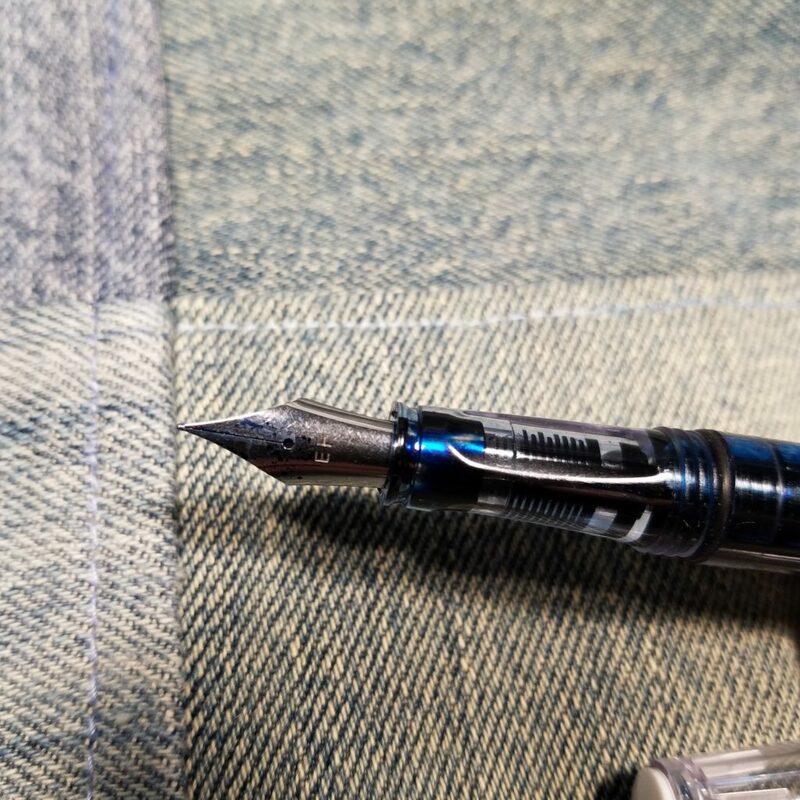 The grip is triangular and a riff on the TWSBI Eco grip. It is narrow. I find it comfortable but many folks won’t. The cap can be posted but the length of the pen becomes ungainly and far too long to be realistically used. The clip is sturdy and holds to my shirt or other location tightly. There is a stop that cuts the depth of the clip and seems unnecessary. The cap and piston have color coded pieces of plastic. I’ve only seen this pen in black, white, and pink. The nib and feed are Pilot style, giving you many options for upgrade. The feed is black instead of clear and my feed was quite constricted leading to a miserly flow of ink. A little work with a razor blade opened up the channel and the flow is perfect. This might not be a problem for everyone. The nib was perfectly smooth out of the envelope. Of course I smoothed it a bit more, but it didn’t need the work to be serviceable. Overall, this is a great little pen. 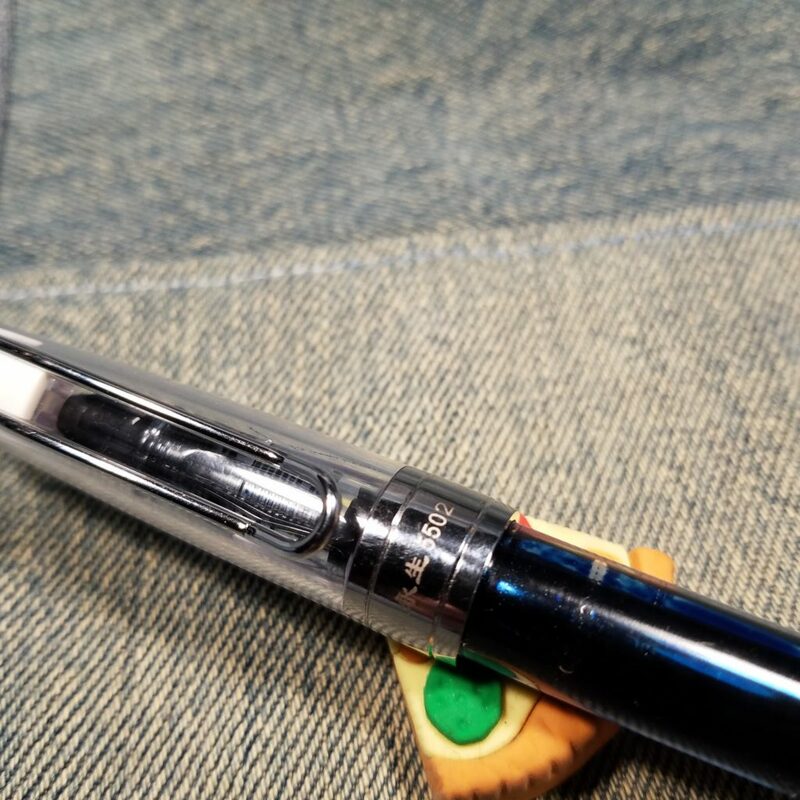 At $5.69 it’s a good price and the ability to swap out Pilot nibs really adds to the usefulness of the pen. That it holds a mammoth 1.8ml of ink means you can write and write and not need to fill. I’ve yet to write mine dry and frankly since getting this pen, I keep reaching for it again and again.